Summary: ExcelTips is a weekly newsletter that provides tips on how to effectively use Microsoft's best-selling spreadsheet program. At the beginning of every year we put together an archive of all the tips published the previous year. Thousands of people currently benefit from receiving a free issue of ExcelTips on a weekly basis. Past issues of ExcelTips are available in our convenient ExcelTips annual archives. Imagine having your own enhanced archive of ExcelTips to use at any time! Imagine how much you will learn with all that information at your fingertips! Individual tips organized by subject in an electronic book, in both Word and PDF versions. The original issues of ExcelTips (in plain-text format). The original issues of ExcelTips Premium (in PDF format, for available years (2014 and 2015), and only on the CD-ROM archive). Updated content not originally in the electronic newsletters. Screen shots that illustrate what you see in Excel as you follow the step-by-step instructions. A clear indicator that shows to which version of Excel the tips applies. The Word-formatted and PDF versions are suitable for printing and maintaining your own book of ExcelTips. ExcelTips archives are published annually, so each volume covers a specific calendar year. To get an idea of what each volume contains, click on the volume name in the table below. You will see a complete table of contents for each volume, organized by topic. ExcelTips archives are available for the low price of only $24.99 each. If you prefer, you can order your archives on CD-ROM for only $32.99. Compare that to regular computer books which can easily cost more for less information. Plus, the ExcelTips archives give you the power and convenience of having electronic files. 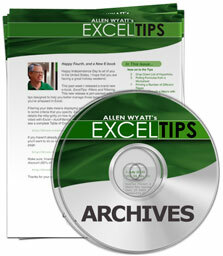 Order Your ExcelTips Archives Today! Each download item shown below includes the size of the download file. (When you're dealing with hundreds and hundreds of pages per archive volume, files can get large.) If you have a slow connection to the Internet, you can save precious time by ordering your archives on CD-ROM, instead of as a download. The ExcelTips archives include PDF documents. To read these documents, you need to have either Adobe Acrobat or Adobe Reader on your system. Adobe Reader is free to download; click the link to get the latest version. To celebrate the release of the ExcelTips archives for 2018, for a limited time (through January 16, 2019) you can download your own copy of the archives for any of the following years at 30% off the regular price. Get your discount; place your order today! You can also order any of the ExcelTips archives by calling our order line: 307-200-0450.